I hope your weekend has been off to a lovely start! For today's post I thought I would share some of my tips and tricks for taking care of orchids. Now I'm not an expert (I feel like I preface everything I say on this blog with that!) but I have had a reasonable amount of experience and luck caring for my little orchid collection (all of mine are Phalaenopsis). I've been able to get a second life out of all the orchid's I've had so far and one particular plant has has actually bloomed three times already and is still going strong! So here are my simple tips - hopefully they will help you out! When we first moved into our apartment I had one orchid that I kept on the windowsill. It did fine in winter but when summer came around the light became way too harsh and actually ended up leaving a burn mark on one of the leaves. Now I like to keep them on my desk or dresser - close enough to get enough light, but far enough away so the window doesn't turn into a magnifying glass and burn my poor orchids to a crisp! If it's a really hot day I'll pull our sheer curtains over the window to filter the light. Apparently one of the most common reasons that orchids don't survive is because they are overwatered, which is why the trick of using a small handful of ice blocks (around 3-4) once a week is so popular. 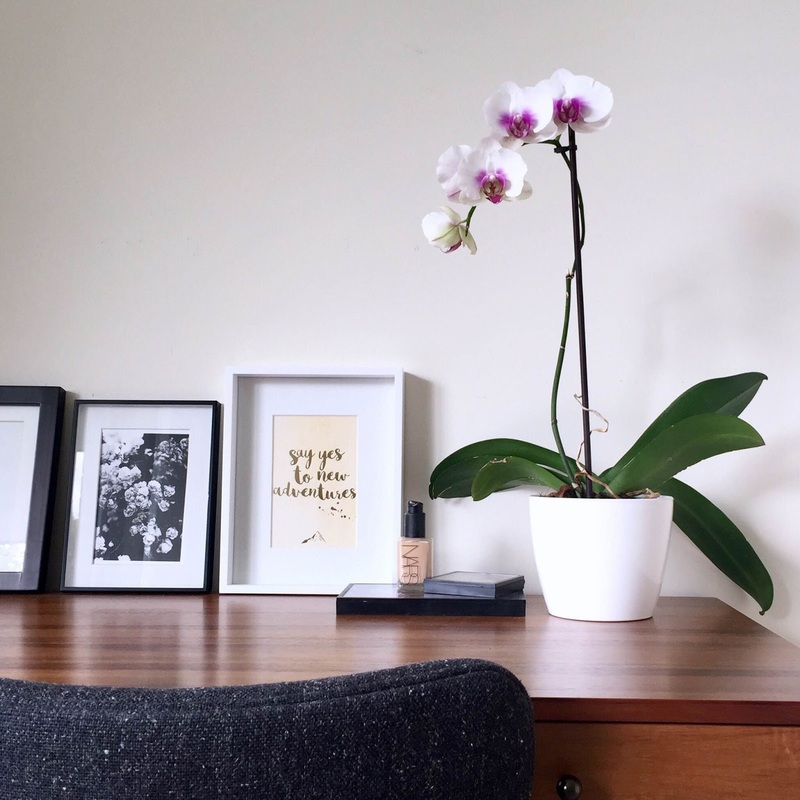 When I first started out with my orchid's I did this and it worked really well for me but after a little research I've noticed there is some conflicting opinions on whether this is really the best method - take a look at this article if you want to read more. Despite this I feel that if you're a beginner, watering with ice-blocks is a good place to start. I've actually switched over to using a spray bottle to give my orchids a good watering roughly once a week, and sometimes a little more frequently if I notice the soil is looking really dry. You want to give it a reasonable drenching so the soil is nice and moist, but leave enough time for it to dry out properly. It's also important not to get water collecting in the centre of the plant on the leaves so I always make sure to spray the water under the leaves right onto the soil. I delayed repotting for ages as I was terrified I would kill my orchid by doing this, but it's really quite simple. This video by Chicago Botanic Garden on youtube was the most helpful I've found. Once I repotted I found my orchid started growing really well and flowered very quickly afterwards! I used a potting mix made especially for orchids that I picked up from Bunnings. Some sites I've read recommend fertilising every few weeks whereas the directions on the fertiliser I use recommend every 6 months. I use this Osmocote fertiliser and have used it roughly every 6 months and so far it seems to be going well! I guess it really depends on the specific fertiliser you're using. These are the tips that have worked for me so far! I hope they're helpful if you haven't had much luck with orchids in the past. It really is such a great feeling when an orchid starts to flower again. Let me know if you haven any suggestions or extra tips - as I said I'm not an expert so I'd love to hear any extra advice! Have a lovely weekend whatever you're up to! My Style Diary - A Pinafore with Pineapples!